Shaking a deep-seated fear is not easy. The mental, emotional and physical sensations related to fear can become powerful, unconscious and involuntary in establishing a hold over us. It can gnaw at your gut so that even at the thought of getting on a horse triggers a host of negative sensations and responses. Take care of yourself. Seek out a therapist to work out an individualized approach that can make a difference. Some therapists and therapies that are helpful include sports psychiatrists and psychologists who specialize in fear related issues and anxiety (some even specialize in equestrian activities); aromatherapy, acupuncture, massage, cranial sacral and body work; Eye Movement Desensitization and Reprocessing (EMDR); hypnosis and self-hypnosis. Begin a fitness program designed to support riding activities. I have found Pilates to be the very best for establishing strong supportive core muscles. The core muscles allow the joints and limbs to act independently and freely, takes pressure off the back, and secures the pelvis in a neutral position which is key for the female rider. 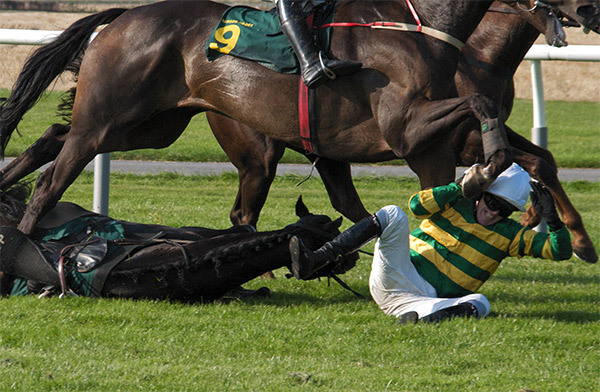 Evaluate the horse (with a professional) for suitability and safety. Become educated in how to make a positive shift in a horse’s nervous system through massage, acupressure, aromatherapy, nutrition, supplements, de-toxification and ground work. Assess and make changes for proper saddle fit for rider and horse. Saddle fit is specific to women and men riders. Educate yourself and visit my website, Women & Horses, to learn all about the female equestrian and her saddle fit needs for safety and security. Make sure the horse is comfortable and as pain-free as possible through joint support, regular dental exams, chiropractic treatments and hoof care. Learn to ride with correct alignment, body bio-mechanics, core strength and the ability to release and relax the limbs. Become educated in techniques that will help control the horse in crisis situations on the ground and under saddle. Once we have executed a plan of this type over time, our rider can regain full confidence again because she has created a trusting relationship and partnership with a solid, healthy, safe foundation. Within the boundaries of this relationship, rider and horse can learn, grow, compete and have fun together. If another incident occurs to test her confidence, she will have both the understanding of why it happened and the tools to adjust. Your horse wants you to take care of yourself so that the two of you can enjoy your time together, whatever that involves. If your horse feels that you doubt yourself, it can create doubt in his or her mind as well, producing an unsafe situation for both of you. I have read and heard from many people that this form of therapy is amazingly effective for people with post trauma stress disorder. Use your search engine to find an EMDR practitioner in your area or contact Dr. Margo Nacey in Berthoud, Colorado 970-443-5467. Pilates Method – Pilates is a unique method of conditioning that allows you to dramatically reshape and redefine your body. Developed by Joseph Pilates in the early 1900’s to help rehabilitate soldiers, it is now the fastest growing form of fitness around the world with clients ranging from top professional athletes to individuals just looking to lose a couple of inches from their waist and thighs. If you ask many Hollywood stars what is their favorite workout, they will often begin talking about the benefits of Pilates. Unlike the typical gym workout, Pilates offers over 500 different exercises that can create a beautifully balanced body without the bulkiness or joint stress often associated with weight lifting. By utilizing breathing patterns that enhance core stability and balance, students quickly develop body awareness with an increased focus derived from a mind-body-spirit connection. Benefits include long, lean, muscles with improved flexibility, balance, and strength.= Use your search engine to find a Pilates studio or instructor in your area. Alexander Technique – Therapists teach simple exercises to improve balance, posture, and coordination using gentle hands-on as well as verbal guidance in an effort to change bad habits that are causing discomfort and pain. Alexander Technique Web Site. Feldenkrais Method – The Feldenkrais Method teaches individuals to become more aware of personal habits of movement and how to improve body motion. Instructors verbally guide only and do not use any hands-on techniques. The Feldenkrais Method is designed to alleviate pain, reduce stress, and enhance self-image. When people have any discomfort, they tend to hold their bodies in altered positions in order to protect the offending area. These positions become habit and often lead to other aggravating symptoms. Feldenkrais Resources Web Site. Trager Approach – The Trager Approach is a form of movement re-education consisting of a series of gentle, passive movements, along with rotation and traction of limbs so as to relieve muscular tightness without pain. Trager Web Site. T’ai Chi Ch’uan – T’ai chi ch’uan, usually shortened to t’ai chi, is one of a group of noncombative, gentle martial arts that developed in China and Japan. It is a system of physical and mental training that is used for achieving understanding of self, expressed through physical movement and self-defense. T’ai chi is used as part of a quest for improved spiritual and physical health. The Dynamic Rider System. The Total Exercise and Biomechanical Solution (Integrating the Pilates Method) Inserts 1 and 2 by Mary D. Midkiff and Maggie Parker. 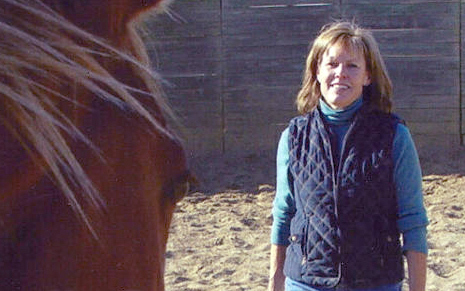 Mary D. Midkiff is an author, horse trainer and riding instructor. She is also the creator and founder of the Women & Horses fitness and performance program.